Asmar Equestrian-sponsored rider Sophie Wells won team gold, plus individual gold in both the Grade IV test and the Freestyle Grade IV test at the at the FEI European Para Equestrian Dressage Championship at Moorsele in Belgium. She was riding her own Valerius. Gold – Anne Dunham (grade Ia), Emma Sheardown (Ia), Sophie Wells (IV), Deb Criddle (III). Gold – Anne Dunham with Sally Anne Brown’s Teddy. Silver – Emma Sheardown with her own Purdy’s Dream. Gold – Natasha Baker with Phillip and Lorraine Baker and Christian Landolt’s Cabral. Silver – Deb Criddle with the Lady Joseph Trust’s LJT Akilles. Gold – Sophie Wells and her own Valerius. Gold – Deb Criddle with the Lady Joseph Trust’s LJT Akilles. Asmar is immensely proud of Sophie and her team mates and wishes them hearty congratulations! Sophie is pleased to wear Asmar Equestrian’s clothing – “it is comfortable, high performance wear for all riders,” she states. 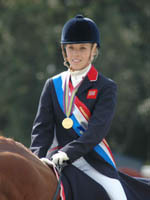 Posted on September 8, 2011, in Asmar Equestrian Clothing Range and tagged dressage, gold medal, para-equestrian, Sophie Wells. Bookmark the permalink. Leave a comment.